WHAT SHOULD THIS MAPS GAMEPLAY BE? Dogs and Snowmen remain in all versions. nice start but to me the yellow text is a little challenging to read. Tweakers12 wrote: nice start but to me the yellow text is a little challenging to read. the trees dont really fit with the cartoonish scene. and the people could maybe look more artsy rather than like south park? or make the whole thing look like that. Jumentum wrote: the trees dont really fit with the cartoonish scene. and the people could maybe look more artsy rather than like south park? if you have artistry in mind, then perhaps you'd like to tackle this suggestion of yours. perhaps you could show me what you want. 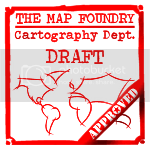 i will draw the map and characters to the best of my abilities and perhaps you won't get the outcome you like. I'm finding the team names a bit difficult read. The 'e' and the 'a' aren't ideally legible at that point size. Maybe up it by 1-2 point sizes, or maybe have the light source for the drop shadow at northwest instead of west? e_i_pi wrote: I'm finding the team names a bit difficult read. The 'e' and the 'a' aren't ideally legible at that point size. Maybe up it by 1-2 point sizes, or maybe have the light source for the drop shadow at northwest instead of west? What do you mean the team names? What's wrong with having a mixture of both? Some art looks really great mixed up with styles. Everything doesn't have to be in one style. 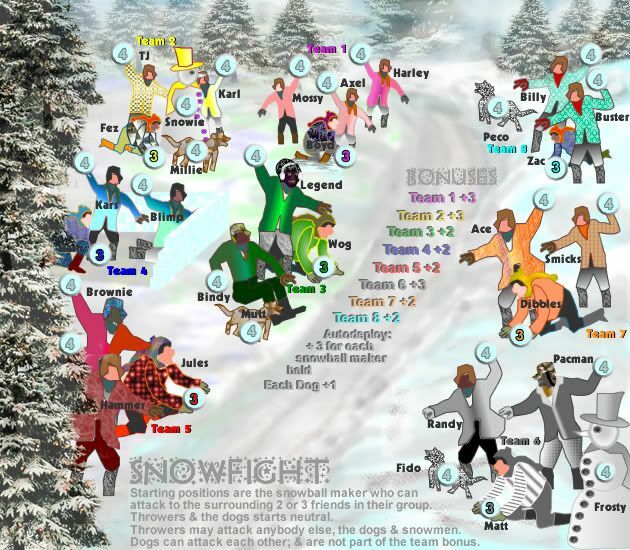 Re: SNOWFIGHT V7 (P4) Gameplay? He means the colored text under each group that designates their team number, i.e. Team 6 is in blue. And I agree, some of them are hard to read. And I have a question of my own: Can the throwers attack or bombard. The way I read it right now they can attack, but it would make a lot more sense if they could only bombard, because they're throwing snowballs at each other. What if the throwers could only bombard and you would have the dogs as points of entry between different groups? Last edited by gameplayer on Mon Dec 01, 2008 4:27 pm, edited 1 time in total. Or, since not all of the groups have dogs, you could have one person from the group be the "hitman" and be able to attack neighboring groups. My problem with the current map is that it seems too chaotic, the borders would be very difficult to defend. gameplayer wrote: Or, since not all of the groups have dogs, you could have one person from the group be the "hitman" and be able to attack neighboring groups. My problem with the current map is that it seems too chaotic, the borders would be very difficult to defend. Fair comment and a good one. excellent idea....how about 1 or 2 more snowmen scattered about and they make up a seperate bonus? neanderpaul14 wrote: excellent idea....how about 1 or 2 more snowmen scattered about and they make up a seperate bonus? Sorry, there is more than enough on this map now. I demand information on the release of the next version! We wouldn't want there to be another surprise AtTACK, would we? TaCktiX wrote: I demand information on the release of the next version! We wouldn't want there to be another surprise AtTACK, would we? You may demand all you like my good man, but of little good it will do you...fear i think my snowman will melt in this heat. Moved to the Bin as per the mapmaker's request. I'd like to get this one finished, some creativity has returned to my fingers. There's still a long ways to go to accomplishing the faces, but it's doable. So if the mods will OK this one, it can possibly be out in time for northern hemisphere's Christmas snow season. Re: SNOWFIGHT V10 (P5) READY FOR XMAS???? Oh and if there is anyone out there who would like to submit something like a dog or a face to get this map ready for Chirstmas, then please do so, and i'll add your name to the map. As in photos of ourselves? Faces or whole bodies in snowball making position? Anyway, here's to a speedy stint in the foundry. I don't completely understand why some teams are worth 3 and some only 2 if neither the snowmen or the dogs are part of the bonus. Industrial Helix wrote: As in photos of ourselves? Faces or whole bodies in snowball making position? No IH. only face drawings, not of yourselves, that would be sacriledge. Industrial Helix wrote: I don't completely understand why some teams are worth 3 and some only 2 if neither the snowmen or the dogs are part of the bonus. Well, those bonuses are only temporary, so they can change. Suggestions? Ahh... I thought you were asking for photos of real people in a snowball fight to use as the people on the map. That would be pretty cool, actually. Well, I wonder if snowball makers as starting positions is the best idea. What if it were throwers are all open to deployment and the makers start neutral. If you did that, then all the bonuses and rules seem just fine to me.